from the nato's: black bean brownies from heaven. black bean brownies from heaven. as i type this, my husband literally just farted on the couch. why? simple answer, i made black bean brownies. black beans in the brownies! you're thinking this is gross. but it was soooooooo good! can you even deal with that in your heart right now? i'm going to answer that question with another question. neither of those questions are getting us anywhere, so i'll stop with the questions and get to these magical brownies. these brownies are healthier... with more protein than a normal brownie and no flour, your gut is going to thank you later. i mean that LIT-RA-LEE and figuratively. plus i threw in some spinach just to see what happens. bam. can't taste the spinach...but adds some iron. these brownies are gluten free. which won't matter for a lot of you. but for lila, it does. the poor child has been eating fruit snacks for her treats--which suddenly taste like rocks when others around you are enjoying baked goods of all kinds. now i tried the trader joe's gluten free brownie mix and as it turns out, these brownies are actually served in hell as punishment for not moving coal into the fiery furnace fast enough. they were heinous. sorry, TJ. that mix is really really really bad. a lot of mixes are. gluten free flour has this weird grittiness about it. so if you can bypass the flour, well... by golly do so. whether you're gluten free or not, these brownies are good. i'm not just saying that. try it for yourself. they are super easy...made in a blender even. 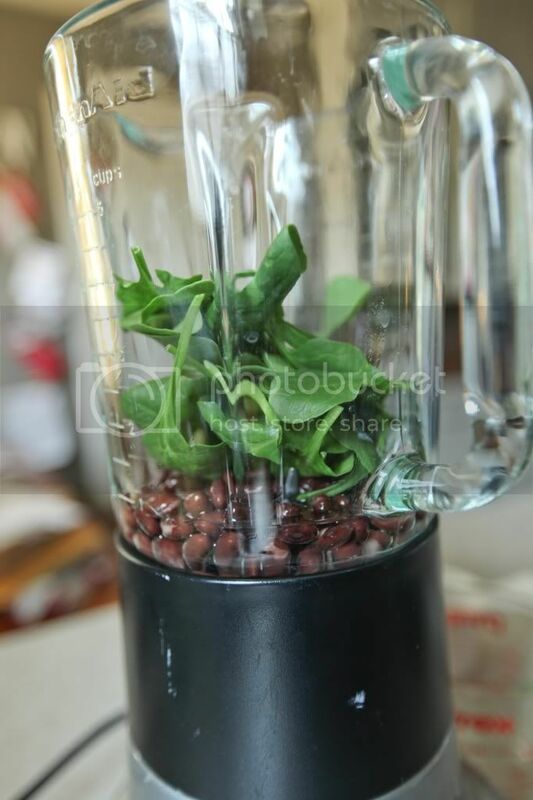 so first, throw your black beans in the blender and give them a couple pulses just to break them up. then add your oil and spinach. pulse them until blended. blend like a crazy person. we want this smoooooth. we now have a Vitamix and it is much better than a regular blender. you'll have to scrape down the sides...then pulse again...scrape the sides...then pulse. you want there to be no chunks or as little as possible. add your vanilla, coffee, salt, sugar, cocoa powder... and i threw in a TBSP of choco chips too for good measure. pulse until it's all smooth. pulse until well blended. you don't need to over do it here. just blend it all together and then stop. spray an 8X8 pan with pam or butter the dish. put your runny brownies in there. take out and let cool completely for a couple hours. really, you don't want to eat these hot. they are much better cold. so store them in the fridge before serving. 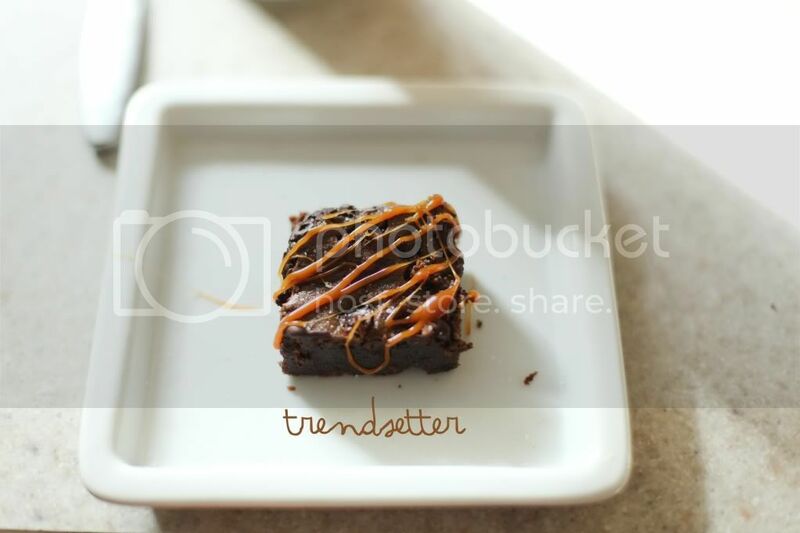 oh, you wanted salted carmel brownies because that's all the rage on the intranet? you will not taste the beans. promise. just fudge goodness you won't feel too bad about eating. i'm not sure i can believe you. Thank you for this recipe!! So excited. I'm making them this week! Yuck! This sounds disgusting, but it also sounds interesting and I have all of the ingredients so I'll give it a shot. So the ground coffee doesn't give the brownies a grittiness texture? I've seen these! Now I have to make them. Suhweeet! it's fate. It's 7am and I got on your blog to find your white lasagna recipe from last year (on the menu this week at the Good house) and saw that you already blogged this. amazing. and thank you. so here's the plan: i'm making these and not telling my unsuspecting husband what's hidden in them. I'll let you know the outcome. you should probably pray for us. PS....you could SO pursue a career in comedy because you crack me up! Thanks for making my Monday morning tolerable! I had a guest poster do something like this last week! I can't wait to try them! I make these ALL. THE. TIME. and they are always a crowd pleaser and it shocks everyone when i say they have beans! I have never thought of putting spinach in these little buggers, so this I will have to try! I have a cookbook called, "Deceptively Delicious" and in it they hide all kinds of fruits and veggies in food.... most of the time it tastes pretty yummy. I have small group later and I think I have every ingredient for this recipe... so I am making them, um, now! Also... How did you find out that Lila was gluten intolerant? How did I not know about your gluten-free-ness??? Welcome to the club! Let me get you a disgustingly dense piece of sandwich bread to make you feel at home. And, I NEED to know, where did you get those cute bird ramekin dishes? My kitchen is done tastefully in birds (at least I think so) And I think those cute little dudes would be a nice addition! Thanks! And I will let you know how the brownines turn out. If these truly are as good as you say they are, you will officially jump to #1 on my favorite persons list. 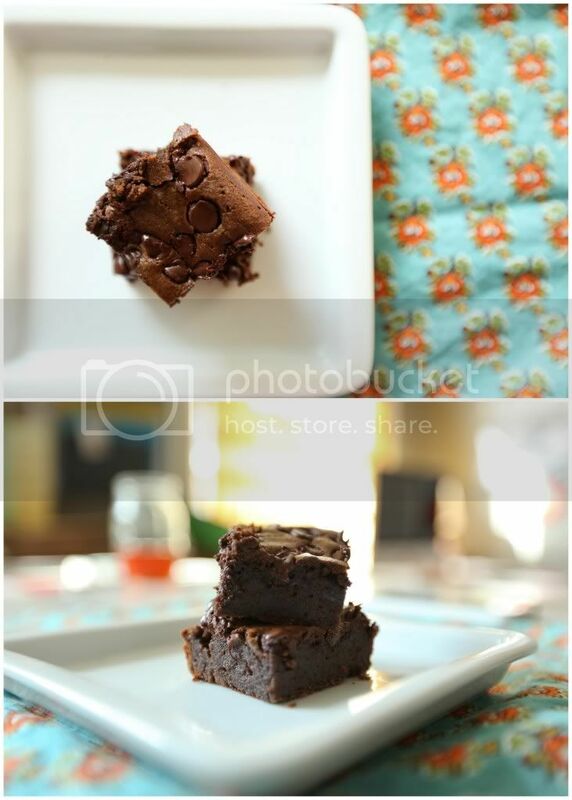 I sooooooooooooooooooo miss yummy gooy brownies. Seriously,the dream about them kind of miss. But, i will be poppin' the beano for sure because i plan on eating the whole 8x8. I heart you. i've been itching to try a black bean brownie recipe, but i'm scared everyone is lying about the taste. i'm taking your word for it. 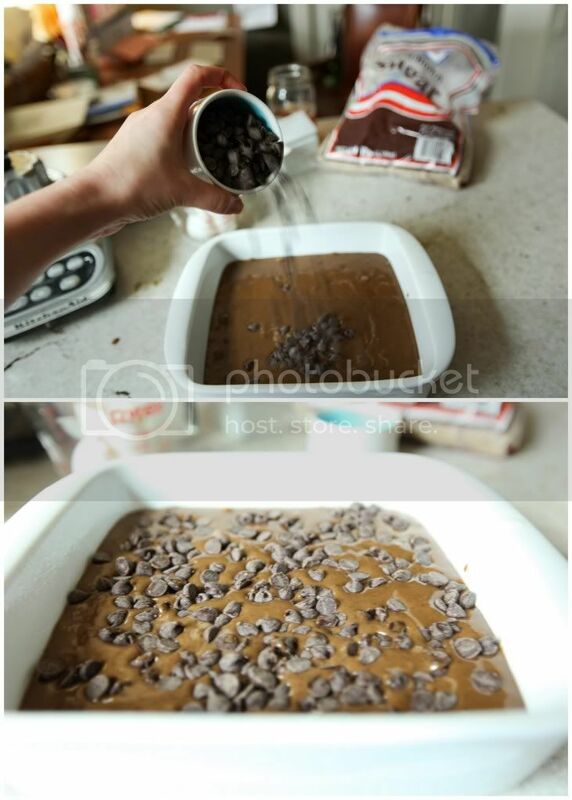 these brownies are being made at my house this week! Sounds NOT good, but you sound SO convincing that they are amazing! Hmmm... may have to try this! You are the funniest!!!!! Can't wait to try this recipe. Oh! Thank you thank you! I'm currently gluten, dairy, soy and potato free for my little nursing hatchling. I'm also trying to lose weight from growing said hatchling which is clashing with my desire for chocolate. And yeah, TJ's brownies are from h-e-double hockey sticks. i totally agree with you on the tj gluten free brownies. they were NOT good. and i like desserts of all kinds. gonna try this. thanks friend! You are like a real FOOD BLOGGER with those pics. Too legit 2 quit. oh lady. these look delish! we tried a black bean brownie recipe once...disaster. have you guys tried Better Batter yet? it has been a life saver for our family since I started having gluten issues. it's a cup for cup flour substitute. i find that i have to bake things for a few extra minutes with it, but no one has really been able to tell much of a difference with it. the main issue has been that they only sell it at one hyvee in the northland which is kind of out of the way for us. Bwahahaha...such a funny post! I was convinced you'd gotten your hands on the "Deceptively Delicious" cookbook by Jerry Seinfeld's wife. Why? Because I have it and its got all kinds of cracy(healthy) concoctions in it to get your kids to eat healthy foods. Like Garbanzo bean chocolate cookies or some such. Can you tell I havent made many of them yet? And I bought the cookbook at a yard sale like 3 years ago! ...after i stop laughing insanely, that is. i've always been leery of poser brownies. i can't believe i am gonna try these. i am crazy! 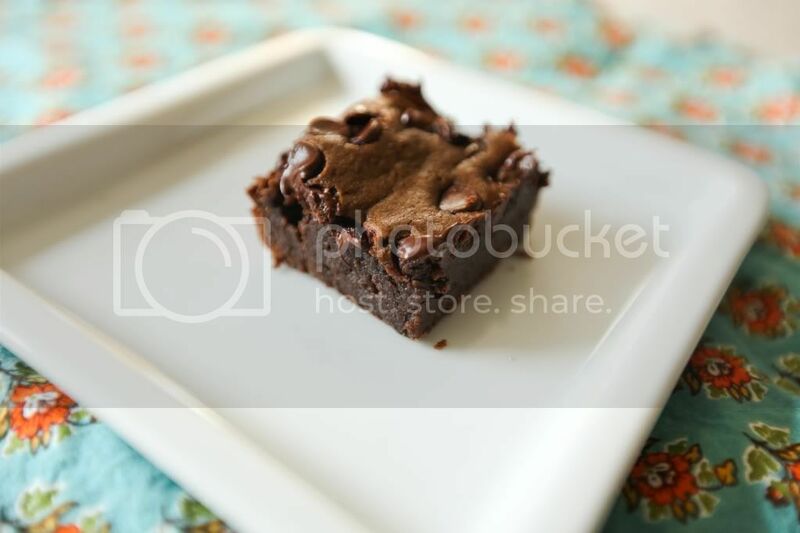 I have made black bean brownies before and they are awesome! I didn't have a blender at the time, so they weren't as smooth as they should be, but still good. More like fudge! beans and spinach in brownies. sounds like something the devil would say. Cool! And welcome to the world of trying nasty gluten-free mixes. Some of them are DREADFUL. However, if you haven't tried them, here are two of my favorite sources: 1) Namaste (chocolate cake & spice cake mixes--awesome. Pancake mix also the best I've tried). 2) The Gluten-Free Goddess website. Great stuff. We have to avoid more than just gluten at our house (dairy & eggs too, among other things) so it's even harder to find mixes and recipes. So I feel your pain! Way to be creative! jennifer, those birds are measuring cups...from urban outfitters. love them. I don't know you, but LOVE your blog...and how your personality comes across in your writing... you make me LAUGH! Thank you! I will be making these..
Holy cats...I just made these tonight, and they are by far some of the best brownies I've had, especially considering I did put spinach & black beans in them! Thank you thank you thank you! This recipe looks amazing! Chrissy Boerman sent me over here, and I'm a new follower! If you had a damn twitter I would tweet it but let's be honest, I don't tweet anymore so no one would care. Why is Lila gluten free? I am sure you blogged about it but I didn't read it, so I need to know. Okay, now I am about to go befriend you on FB just so I can have a little bit more of you in my life. i actually made these last night. and they were better than the ones i tried previously with the bean mixture...and i added the spinach too. i just miss the crunchy edges of real brownies...cause that's my favorite part. emily's comment was funny. and i have to agree...these must be satan's brownie of choice. did you say black beans and brownies? huzzah! i love a healthy yummy treat! I have a hard time believing this would be good but I'm going to trust you Jami Nato. I'm going to give these a shot this afternoon. Then I can eat them while watching the Biggest Loser tonight and maybe not feel guilty. they sound really good to me, but I love black beans and spinach, so why not!? I am making them THIS WEEK! 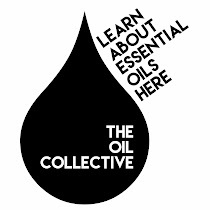 I love love love your blog!! I check it everyday just to see if there is something, I guess you could say I blog stalk you!! :) Thanks for keeping your posts so interesting! wa ha...you crack me up! Yup, I can vouch for the credibility of black bean brownies. The farting and the tastiness. Can't say I have ever been brave enough to add spinach. But gosh darn gonna try that too! And my tummy thanks you for the gluten-free. Truly, it does! O MY! Thank you! Lots of gluten allergies going on in my house and you are SO right about Trader Joe's mix. ugh. You are full of magical magic things. Jami, it's Brian. Court made your brownies...you always told me about compliment sandwiches so here it goes. Your sense of humor is awesome, these brownies are the worst dessert i have ever tasted, but you make real good oatmeal chocolate chip cookies. Pinned to try :) Thanks...they look super yummy! My favorite cookbook is Deceptively Delicious, so I'm gonna love these brownies!!! I adore Sweet Potato HOT CHOCOLATE, I should blog about that. It's sorta ridiculous how freakin hilarious you are. Like, HOW do you make me laugh every time I visit this blog!? I'm dying over the trendsetter picture and THEN I just about lost it with the inclusion of the last fart noise. I've gotta try these fartilicious brownies of yours but what I'm MOST excited about are the blondies I peeped on your Instagram. Can't wait! I work in a greenhouse with a bunch of women, some of which have to eat a gluten-free diet. We all love to bring snacks for coffee break and have made these before and yes, found them to be amazing as well! In case you are looking for more great recipes to cook for your daughter, take a look at this blog: http://www.mennonitegirlscancook.ca/. They have a "gluten-free" section on the left. In case you don't know what a Mennonite is, well, the definition is complicated and extremely varied. Anyway, I guess because I grew up going to and now attend a Mennonite church, I'd be considered a Mennonite and yes it's true - we sure can cook!! Enjoy - thanks for your blog, Jami. Your writing style reminds me so much of my eldest daughter's - I appreciate your honesty and candid take on things. um hmmmm i'm gonna have to trust you on these. sound pretty yucky.. but look delish!! I would have commented earlier, but was too busy eating an entire pan of these by myself. Ok, not really. I shared 3 with my daughters and husband. But really, these are awesome! I've had gritty BB Brownies before and they were NASTee, but these are unbelievably smooth. Is the secret keeping them in the fridge? Whoa! These are my kind of brownies. Can't wait to try them. Thanks for the recipe. By the way...how are ya? I made these tonight. My kids had no clue they weren't "real" brownies. I can't believe they really tasted like brownies!! Pinning this to save for later! Oh and I used dried beans (I have a thing against cans) - turned out great! With vegetarians in the house, it adds to their protein count! I also went old school and made some whipped cream to go with them! We aren't gluten sensitive, but have friends that are. We'll be taking this cake to the next get together. i made your brownies the other night and everyone loved them. i substituted great northern beans for the black beans since my can was seasoned with garlic and spices. thanks for the recipe and your blog. love reading! jami, made the brownies. delicious. thanks for sharing. i posted it on my blog (which has about .01% of the readers yours does) so be ready for some big traffic. thanks for sharing about lila too. my heart goes out to you. God does give you all that you need to be a good mom. this has nothing to do with lila's particular needs but just being an overwhelmed mom of littles... i just started reading loving the little years. 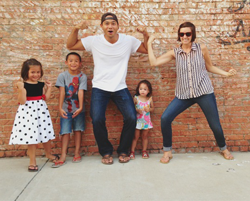 it's good, easy reading, light encouragement from a mom of 5 (or something crazy like that). it's blessed me, just thought i'd share it. love these. big hit among the whole family....kids included! I made these tonight and they were a HIT! I actually like them better then real brownies! We had them with fresh strawberries and it was awesome! Thanks for the recipe! I'm going to share it with everyone! Ha! 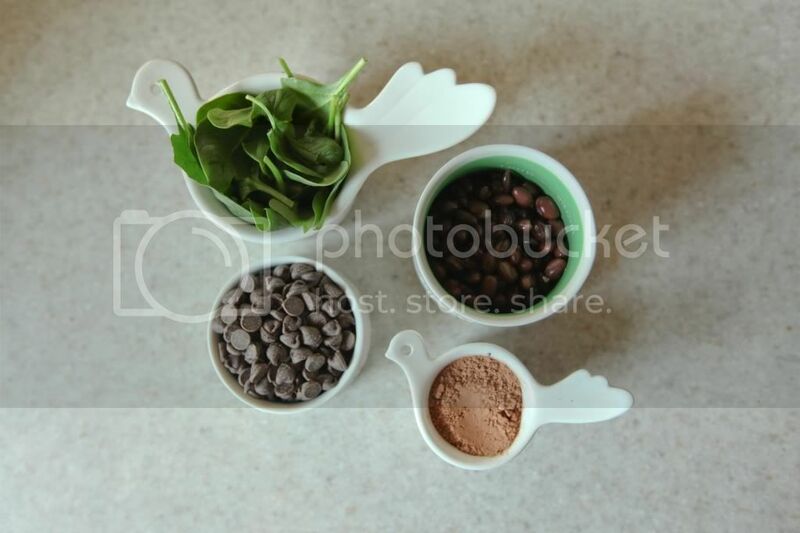 Your description of TJ's gluten free brownie mix is genious! Your family must be awfully trusting to sample some of the combinations you come up with but they must also get non-stop laughs from your wonderful sense of humor. FYI -- I grabbed your Grab A Button code from the upper right hand margin of this page but your code has an double closing bracket "/>" stuck to the end of it. I'm not sure if it may cause some a problem for some sites but I thought you'd want to know. Thanks for sharing your recipe and your wonderful photos and writing! Ha! Your description of TJ's gluten free brownie mix is genious! Your family must be awfully trusting to sample some of the combinations you come up with but they must also get non-stop laughs from your wonderful sense of humor. Thanks for sharing your recipe, photos and writing! i made these the other day. delish. now i'm trying them w/ peanut butter instead of oil.